A decrease in SO2 emissions has been significantly influenced by the tightening of legislation concerning the concentration of sulphur in liquid fuels. The permitted concentrations of sulphur in fuels were not exceeded in 2012. This indicator shows the concentration of sulphur in fuels used in stationary heating units as well as fuels used in road, air and water transport in Slovenia. In combustion of fuels containing sulphur, SO2 is released into the air. Due to its acidic properties, SO2 causes deposition of acidic substances on water bodies and on the ground. Acidification may adversely affect water ecosystems of rivers and lakes as well as forests, crops and other vegetation. Due to the acidic properties of sulphur dioxide, damage to buildings and cultural monuments may also occur. SO2 has been proven to contribute to the formation of particulate matter in the atmosphere. 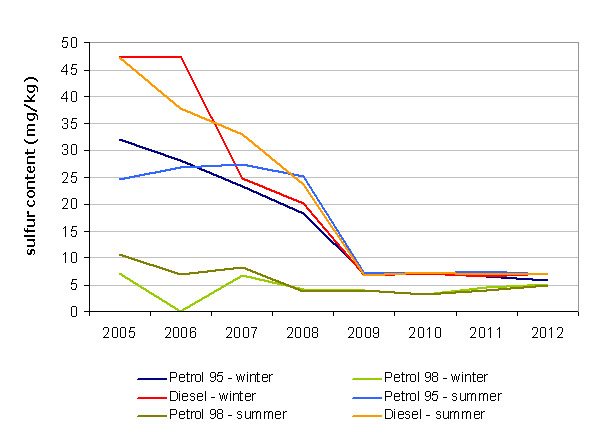 Fuel Quality Reporting - Slovenia (2005-2012). Fuel Quality Reporting - Slovenia (2006-2012). 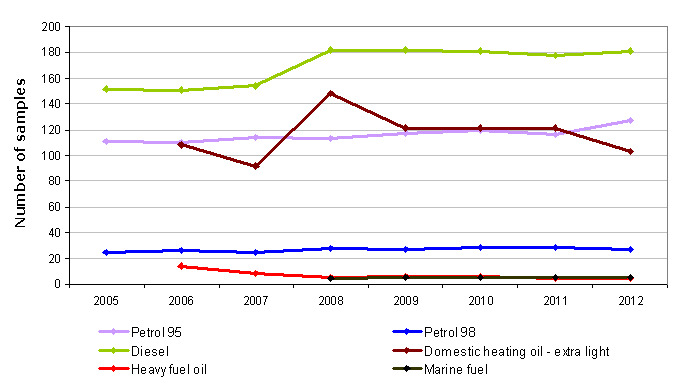 Fuel Quality Reporting - Slovenia (2008-2012). To reduce emissions of sulphur dioxide generated during the combustion or incineration of certain types of liquid fuels, thus reducing adverse effects of such emissions on human health and the environment. The Decree on the physical and chemical properties of liquid fuels (Official Gazette of the Republic of Slovenia, Nos 63/06, 92/06 and 74/11) prescribes the permitted concentration of sulphur in petrol and diesel fuels. Until the end of 2008, the permitted concentration was 50 mg/kg of fuel, while from 1 January 2009 onwards, it has been 10 mg/kg of fuel. For stationary heating units, the permitted concentration of sulphur in regular and extra light fuel oil is important. Until the end of 2007, the permitted concentration in extra light fuel oil was 0.2% m/m, while from 1 January 2008 onwards, it has been 0.1% m/m. The permitted concentration of sulphur in fuel oils is 1% m/m. Aicraft fuels include JET A-1 fuel for jet engines and 100 LL aviation gasoline (avgas). The permitted sulphur concentration in JET A-1 fuel is 0.30% m/m or 3000 mg/kg (in accordance with the Aviation Fuel Quality Requirements For Jointly Operated Systems/AFQRJOS or the Def Stan 91-91 standard), while the permitted sulphur concentration in 100 LL fuel is 0.05% m/m or 500 mg/kg (in accordance with the Def Stan 91-90 standard). The permitted concentration of sulphur in ship fuels from 1 January 2008 onwards has been 0.1% m/m for gas oil and 3.5% m/m for diesel (Marpol convention, ISO standard 8217/2005 and ISO standard 8217/2010). In Slovenia, annual SO2 emissions have been decreasing steeply, largely as a result of more stringent legislation as regards sulphur concentration in liquid fuels, which significantly affects the emissions of exhaust gases. In combustion of fuels that contain sulphur, SO2, is emitted into the air, contributing to acid deposition, which can potentially lead to changes in soil and water quality. Delayed impacts of acid deposition are important due to their adverse effect on water ecosystems in rivers and lakes and due to the damage they cause to forests, crops and other vegetation. SO2 emissions also contribute to the formation of particulate matter in the atmosphere, which adversely affects human health. Monitoring of the quality of liquid fuels is carried out each year, when average concentrations of sulphur in fuels are measured. For the purposes of implementation of the monitoring programme of the properties of liquid fuels, the calendar year is divided into the summer and winter seasons. The summer season lasts from 1 May to 30 September inclusive, while the winter season lasts from 1 October to 30 April inclusive. Within the monitoring of fuels in 2012, 4 samples of fuel oil and 34 samples of extra light fuel oil were taken at stationary heating units. In addition, 120 samples of extra light fuel oil were taken at storage facilities. In the period 2006–2012, the concentration of sulphur in extra light fuel oil decreased and remained within the permitted limits. The average annual values were as follows: 0.058% m/m in 2009, 0.062% m/m in 2010, 0.066% m/m in 2011 and 0.06 m/m in 2012. The concentration of sulphur in fuel oil also decreased in the same period and remained within the permitted limits. The average annual values were as follows: 0.54% m/m in 2009, 0.56% m/m in 2010, 0.57 % m/m in 2011 and 0.72 % m/m in 2012. As of 1 January 2008, the permitted concentration of sulphur in extra light fuel oil has been 0.1% m/m, while in fuel oil, it has been 1% m/m. Therefore, the permitted values were not exceeded despite a slight increase in the period 2010–2012 compared to 2009. Within the monitoring of sulphur content in fuels used in road transport in 2012, 127 samples of 95-octane petrol, 27 samples of 98-octane petrol and 162 samples of diesel were taken. In the winter and summer periods from 2005–2012, the average concentration of sulphur decreased in all types of fuel used in road transport. In 2012, the permitted concentration of sulphur was not exceeded in any of the fuel types. There were no significant differences in sulphur concentrations between the summer and winter period of 2012. In the period 2009–2012, the differences between sulphur concentration in 95- and 98-octane petrol during the summer and winter periods became insignificant. Among other things, this is a consequence of measures introduced due to the newly prescribed permitted concentrations of sulphur in petrol and diesel fuels (10 mg/kg of fuel), which have been in force since 1 January 2009. 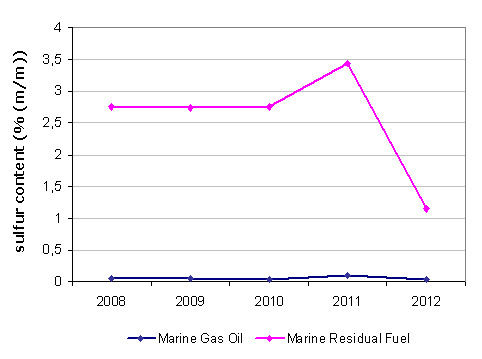 In 2012, 5 samples of ship fuels were taken – 2 samples of diesel and 3 samples of gas oil. The average concentration of sulphur in ship fuels did not fluctuate significantly in the period 2008–2012. The permitted concentrations of sulphur in ship fuels (3.5% m/m for diesel and 0.1% m/m for gas oil as of 1 January 2008) were not exceeded. According to rough estimates, the concentration of sulphur in aircraft fuels in the period 2008–2012 was 300–600 mg/kg for the JET A-1 fuel and 3– 4.5 mg/kg for 100 LL fuel. Concentrations of sulphur in aircraft fuels were below the adopted limit values. In Slovenia, the concentrations of sulphur in fuels are below the permitted values, which will have to be maintained into the future. Regular monitoring of liquid fuels will also have to be carried out on a regular basis. Namely, as sulphur concentrations decrease, SO2 emissions decrease as well, which contributes to improved human health and environment.